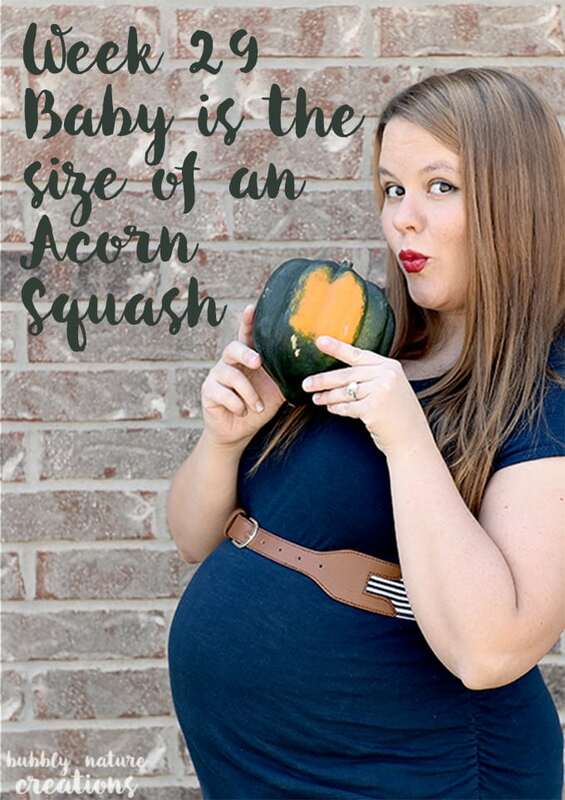 Last week I started a series where I share the size of our baby in relation to fruits and veggies. I also come up with a recipe each week with the particular fruit or veggie. Last week the baby was around the size of an eggplant and I made a Garlic Roasted Eggplant recipe. 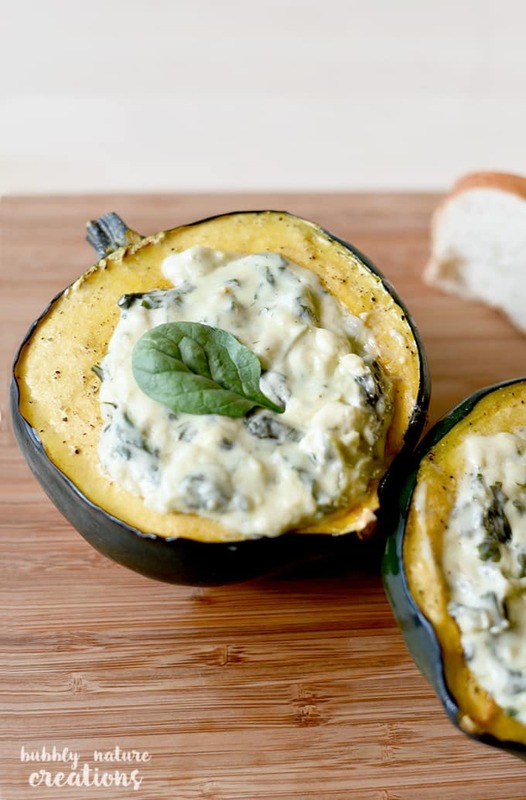 This week our baby is the approximate size of an acorn squash and so I came up with this yummy Roasted Acorn Squash with Havarti Spinach Artichoke Dip! I’ve had so much fun coming up with these recipes and this pic was a result of my hubby and I just being silly! This week I wasn’t real sure about the acorn squash because I really haven’t ever cooked with it. I figured that it would be a lot like pumpkin which I love to roast. Luckily it was super simple to roast and roasted even better than a lot of pumpkins I have tried. The cheese I used is from Arla Dofino. Arla Dofino cheeses have been traditionally crafted in Wisconsin for more than 100 years and are naturally good from farm to fridge. I found some delicious Arla Dofino Havarti cheese in creamy and dill and decided to make the dip using these. I am so glad that I did because it turned out to be the most delicious spinach artichoke dip I have tried! I LOVE the subtle dill flavor that the Arla Dofino dill Havarti added to this recipe. These cheeses are also great on their own as a snack too and so I like to pick some up whenever we go to the grocery store! 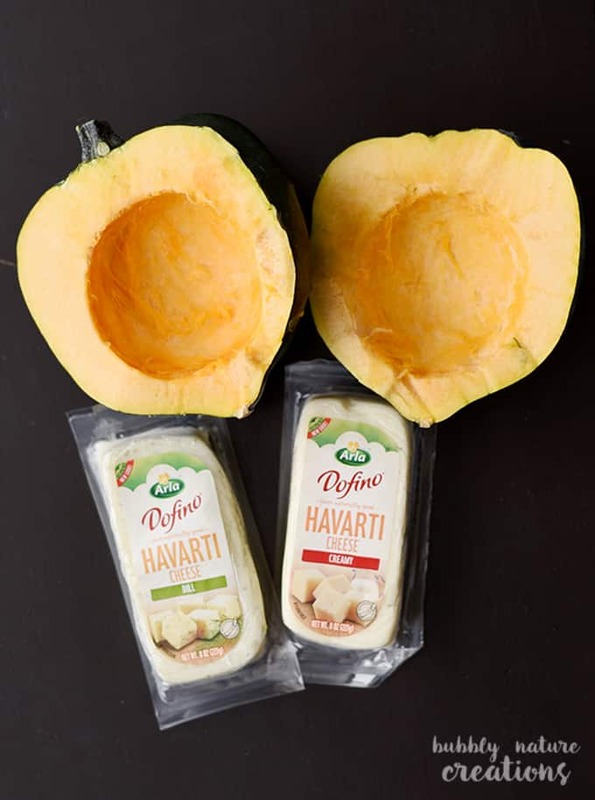 The Arla Dofino brand of cheese includes a delicious range of family-friendly cheese types such as Havarti and Gouda. The cheese is free of added hormones, artificial flavors and preservatives, and crafted with quality, naturally delicious ingredients. We dipped some veggies in ours and also spread it onto pieces of bread. Each time you dip or spread it you’ll want to cut into the acorn squash to get the slightly sweet taste of the squash to mingle with the creamy dip. Or you could just scoop it with a spoon and eat just the acorn squash with the cheese dip. It tasted great that way too! Preheat oven to 350 degrees F. Place the acorn squash in a casserole dish or baking dish with sides flesh side up. Fill the bottom of the dish with a little water to keep the acorn squash from burning. Put a pat of butter in each cavity of the acorn squash. Sprinkle on a little salt and pepper. Roast the squash at 350 for around 60 minutes or until the flesh becomes soft. Around 30 minutes in... take a basting brush and brush the melted butter around the flesh of the squash to keep it from drying out too much. Meanwhile in a medium sized saucepan of medium- low heat melt the butter and then add the spinach and artichokes. Cook until spinach is wilted. Add the sour cream, garlic, paprika and cheese and stir continuously until it is all melted together. Add a Tbsp. of flour to the cheese if it is too runny... if not skip this step. 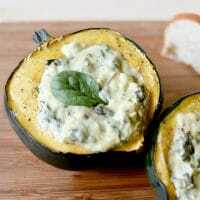 The dip should be a consistency that will stand up in the acorn squash and not run out. Turn the heat to simmer and stir every couple of minutes until the acorn squash is cooked. Once the squash is cooked take out and let cool for a few minutes. Add the cheese dip in the middle of the squash and serve with bread, pita chips, veggies etc. I hope you like the recipe for this week and be sure to check back next week for another one! Also check out this Snack-to-School Facebook sweepstakes for Arla Dofino on their facebook page. Arla Dofino is hosting a Snack-to-School Facebook sweepstakes from September 15 to October 15, 2015. One winner will receive a semesters worth of Arla Dofino cheese and a Genuine Thermos lunch kit. • How to enter: During the Sweepstakes Period, visit the Arla Dofino Facebook page and click the Sweepstakes tab, and follow the instructions to complete the provided registration form to receive one entry. 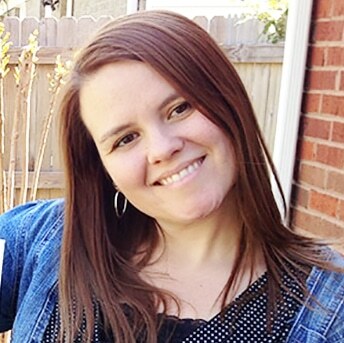 can I just say I love love love your maternity countdown recipes? so cute and creative! 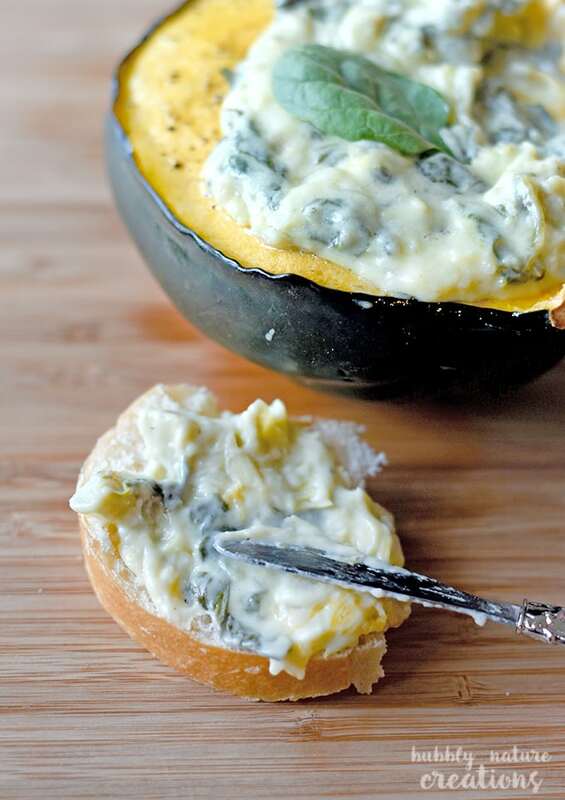 This definitely look like a great way to use Acorn squash! So delicious. Thank you so much for sharing. Can’t wait to try these at home.